At the end of Part 1, Quatermass’s prospective son-in-law Capt. John Dillon got a face full of whatever’s inside those meteorites. Quatermass said there was something on Dillon’s face, but as this episode begins, it’s already disappearing. Examining his companion’s face, Quatermass observes that’s there still some discoloration near the hairline, but Dillon is behaving weirdly. Like the old farmer, he’s woozy and disoriented, and he’s hostile to Quatermass touching him. Guards from the super-secret research facility arrive then and take Dillon away. They tell Quatermass that he must leave—now. Dillon will be looked after. They speak in oddly stilted and atonal voices and I don’t think it’s just bad acting. Quatermass wants to come with them to be sure his friend is all right, but they all–Dillon included–refuse this request. Dillon snarls that Quatermass mustn’t follow. The guards put him into their truck and return to the facility. The old man, who isn’t very clean at the moment, tells Quatermass that he used to travel this way regularly on his vagabond rounds and didn’t believe the whole village could be wiped out so completely since his last visit about a year ago. He was informed of the village’s destruction by the inhabitants of the new, pre-fab town a few miles down the coast on the other side of the secret facility; the workmen for the place and their families live there. As Quatermass looks over the bulldozed rubble of the former village, he notices something more disturbing. Among the ruins are many, many broken fragments of meteorites similar to the one that just landed, only these are crumbled and weathered, having been exposed to the elements for some months. Quatermass next visits the pre-fab town and finds them unhelpful. The people who live there aren’t all stiff and weird like the guards, but the officious town administrator stands on points of government security and refuses to do anything to help Quatermass find out what’s happened to Dillon. There’s a big poster on the wall about the importance of security. There are no local police; all that sort of thing is handled by the facility security guards, who are precisely the ones who took Dillon away. While they’re talking, a little girl is also in the administrator’s office, with a blank zombie-like stare and a strange double-circle mark on her arm. When her mother comes to fetch her, Quatermass learns that the child has been like this for a couple of months; she also found one of the meteorites when it landed and since then, keeps trying to get into the factory. He asks too many questions, however, enough to rouse both the mother’s and administrator’s suspicions and he’s sent off. After this, there’s nothing for Quatermass to do but go back to London and see if someone in a higher official capacity can be of more help. Before he sees anyone, however, he stops off at the Rocket Group offices to tell his daughter what happened to her fiance. Paula is naturally worried, and phones the radar station where Capt. Dillon was assigned to see if he’s returned there. She learns that he’s been transferred. That’s the last we’ll hear about the captain for awhile. Also at the offices, Dr. Leo Pugh has been working on testing the meteorite fragments. He’s created a plaster model of what he believes to be its original shape before it burned through the Earth’s atmosphere. The shape is more streamlined and manufactured-looking than one might expect a chunk of natural, space-born rock to be. From the calculations he’s tentatively made on the trajectory of these objects, Leo believes that they are coming from some place beyond the Earth’s atmosphere, but well within the Moon’s orbit. A small asteroid in orbit, or a spaceship perhaps? While Paula, Leo, and the rest of the Rocket Group continue to work on locating the source of these so-called “meteorites,” Quatermass calls on the Metropolitan Police. Inspector Lomax, whom he worked with during The Quatermass Experiment is no longer there. The inspector currently in Lomax’s old office is willing to listen to his story about Dillon and the security guards, until the name of Winnerden Flats comes up. Then the inspector wants to know why Quatermass doesn’t ask his own high-and-mighty Ministry for assistance. 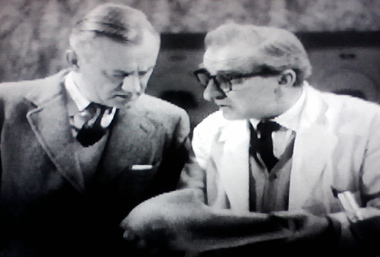 Quatermass is astonished; the same government office that funds his project is responsible for that top-secret factory? Since the police are of no use, he takes the inspector’s advice and consults his project officer at the Ministry, a man named Fowler. Fowler does know about the mystery facility. Its purpose, he tells Quatermass, is to create synthetic food sources (Britain was just emerging from war-time food rationing in the mid-1950s, so abundant food supplies were very important). The project has become enormously successful in the past year, hence its sudden expansion into full-production factories and increased security. All the same, Fowler is concerned that there have been security breaches. A Member of Parliament named Broadhead has evidence of industrial espionage. Since Broadhead is conducting an inquiry in the Minstry building at that very moment, Fowler brings the MP into his office so he can show Quatermass air photos of what look like identical factories to the one in Winnerden Flats–except that these factories are in Siberia and Brazil. Broadhead invites Quatermass to join him at the inquiry he’s holding with the Winnerden Flats committee. Everyone at the meeting besides Broadhead appears to be zombie-fied. They refuse to speak at first when Broadhead wants to show them his photographs, even though he’s trying to help them with what appears to be a major security problem. They refuse to look at the photos. When one man speaks, insisting there is no problem, his voice has that same harsh and atonal sound as the guards at the factory. One of the men is holding his head sort of tucked down to one side, as if he’s trying to hide his face in his coat collar. He doesn’t seem as far gone as the other committee members. When Broadhead addresses him directly, demanding that he look at the photos, the man is forced to turn his head so that Broadhead, Quatermass, and the audience can see that he has a double-ringed mark on the side of his face, a mark just like the little girl had on her arm.